Spider veins and varicose veins are very common problems generally affecting people in the age range of 30 to 70 years. Approximately 55 percent of women and 45 percent of men in the United States suffer from some vein related problem. More specifically, 20 to 25 percent of women and 10 to 15 percent of all men will have visible varicose veins. Varicose veins will affect fifty percent of the population, over the age of fifty. These conditions are generally not regarded as serious medical problems, but they do cause the skin to have an unhealthy appearance. Spider and varicose veins occur underneath the skin, but the effects unfortunately are clearly visible on the skins surface. Varicose veins are abnormal enlarged or swollen veins that can be flesh coloured, but are usually dark purple or blue in colour. The veins often have the appearance of cords that are twisted or bulging. For darker skinned people, the color difference from the rest of the skin is not as noticeable. However, for fair-skinned individuals the colour of the veins in combination with the swelling above the skin surface makes the skin look very displeasing. The legs are the areas of the body usually affected by varicose veins. In particular, they are found on the backs of the calves or on the inside of the legs. These (venous telengiectasias) are smaller than varicose veins. These problem veins reside closer to the surface of the skin than do varicose veins and are red and/or blue in color. 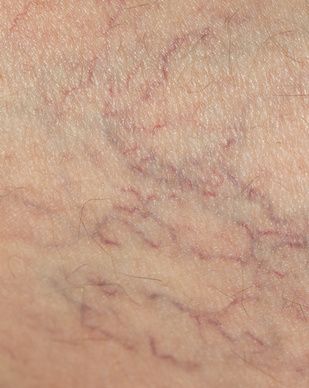 Spider veins are short, thin, jagged lines that look like tree branches or the lines in a spider’s web. These veins are mostly found on the thighs, ankles, and feet, but can also appear on the face. Once again, they are very noticeable in fair-skinned or pale-skinned individuals and for many are a serious cosmetic skin blemish. The diagnosis of spider or varicose veins is quite easy because of the obvious visual characteristics of these problems. A physician, in addition to looking at the obvious signs, may also perform some diagnostic tests. The physician may apply a tourniquet or use direct hand pressure to examine how the blood fills and flows through the affected vein (Trendelenburg test). The doctor may also order a Duplex ultrasound or Doppler scan to analyze the blood flow in the vein. This technique uses high-frequency sound waves to measure the speed of blood flow and to examine the vein structure. This test is generally used to uncover whether the varicose veins are being caused by some other condition, unrelated to the vein structure. A venogram may also be used in diagnosis. This test involves injecting a dye into a vein in the foot and x-rays are taken that outline the veins in the legs for a closer look at the vein structures.